Rilastil Lipofusion Intensive Night Cream is a treatment with targeted action to contrast cellulite imperfections that works during the night, exploiting the principles of chronobiology. TO CONTRAST CELLULITE IMPERFECTIONSWith Euglena Gracilis, Biospecific Peptides, Essential Oils and Vegetable ExtractsIt does not contain any ingredient not recommended in pregnancy. Rilastil Lipofusion is an innovative treatment, without caffeine or bioflavonoids, combining synergistically principles of phyto-aromatherapy and last generation cosmetologic active principles to contrast and prevent cellulite imperfections. Rilastil Lipofusion Intensive Night Cream is a treatment with targeted action to contrast cellulite imperfections that works during the night, exploiting the principles of chronobiology. Its formulation has been potentiated in the line specific active principles and its efficacy is completed by a calibrated blend of essential oils with relaxing effect. Its creamy texture is also suitable for long massages. It does not contain any ingredient not recommended in pregnancy. 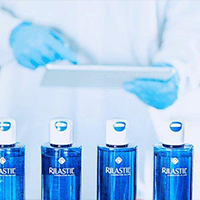 For a complete treatment, it is recommended to use it combined with the other products in the Rilastil Lipofusion line (Concentrate Ampoules and Fluid). INGREDIENTS: Aqua (Water) • Steareth-2 • Paraffinum liquidum (Mineral Oil) • Caprylic/Capric Triglyceride • Ethylhexyl Palmitate • Euglena gracilis Extract • Steareth-21• Dimethicone • Propylene Glycol • Oryza sativa (Rice) Bran Oil • Prunus amygdalus dulcis (Sweet Almond) Oil • Helianthus annuus (Sunflower) Seed Oil • TEA-Hydroiodide • Butyrospermum parkii (Shea) Butter • Olea europaea (Olive) Oil Unsaponifiables • Aesculus hippocastanum (Horse Chestnut) Extract • Curcuma zedoaria Root Oil • Zingiber officinale (Ginger) Root Oil • Eugenia caryophyllus (Clove) Flower Oil • Tripeptide- 3 • Decapeptide-2 • Escin • Citrus aurantium bergamia (Bergamot) Fruit Oil • Foeniculum vulgare (Fennel) Oil • Cinnamomum zeylanicum Leaf Oil • Piper nigrum (Pepper) Seed Oil • Limonene • Carbomer • Linalool • Cera alba (Beeswax) • Eugenol • Arginine • Citral • Xanthan gum • Glycerin • Cinnamal • Lecithin • Tocopherol • Butylene Glycol • Phenoxyethanol • Ethylhexylglycerin • Benzoic Acid • Potassium Sorbate • Dehydroacetic Acid • Pentaerythrityl Tetra-di-t- Butyl Hydroxyhydrocinnamate • Disodium EDTA.